Eclectic home décor can be daunting but well worth the risk and if you like our store – chances are you like the eclectic look. These are my tips to get you started. There are two mistakes generally made when shooting for eclectic home styling. 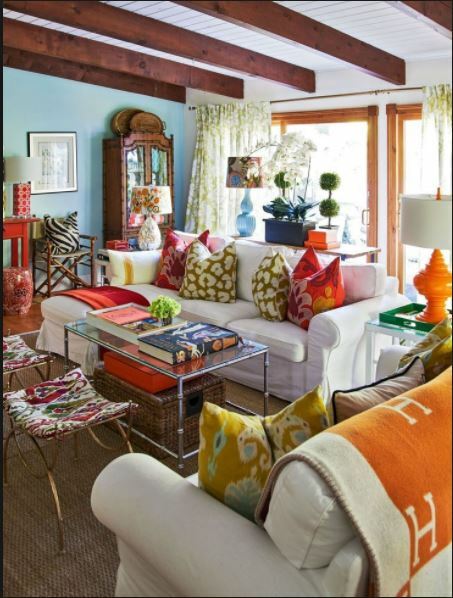 Firstly, the term eclectic is mistaken as a free pass to mix and match everything and anything. This is not the case. 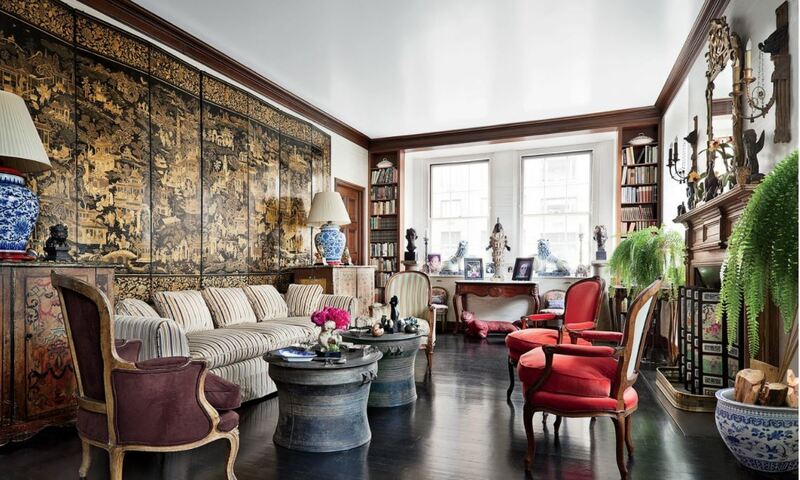 Even an eclectic scheme needs a thread to tie it together. So, start with picking a theme or a colour palette. If you are trying to combine traditional, Victorian opulence with modern, clean lined minimalism under the guise of ‘it’s eclectic’ it will never fly because the themes are so very different. If you don’t know what theme you like – do some research! Houzz is a great place to start digging. Decide what ‘feel’ you wish to accomplish (fresh/ luxurious/ cozy/ traditional…) and search for examples to inspire you. An Eclectic interior is one that takes it ten steps further which means you’ve got to get comfortable with trying new and sometimes unusual combinations. This is where people generally fall into the second mistake: They stop too soon! If you want the symphony of texture, pattern and interest then you need to be brave and take some risks. 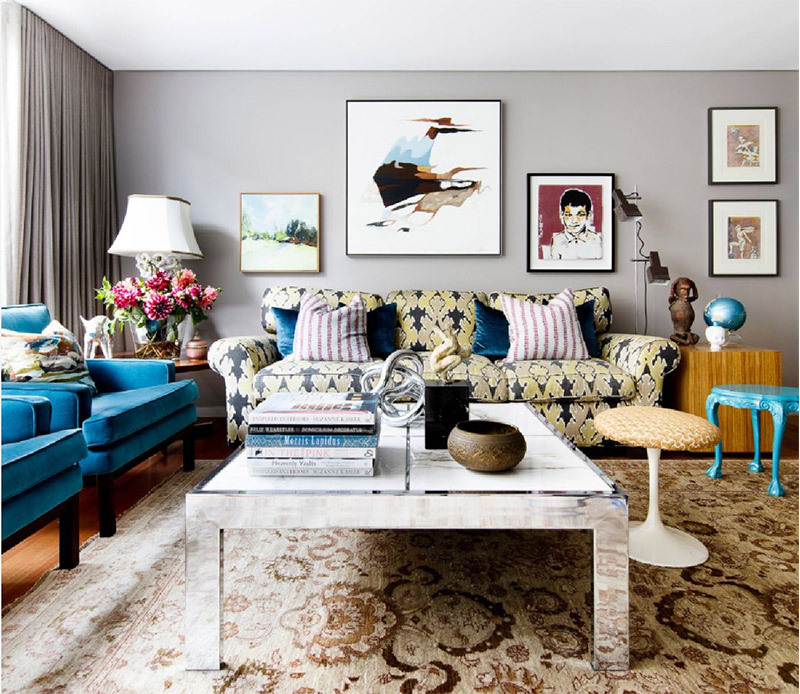 An eclectic living room can have twelve or more different patterns. This level of complexity transcends the normal, “matchy-matchy”, safe schemes that we are used to (maybe bored of) and instead steps into something that closer reflects the subtle nuance of our individual tastes (who doesn’t want their home to reflect them?). 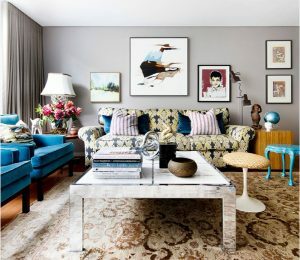 Fit the theme or colour palette – this is critical for the larger elements (sofa, rug, wallpaper, wall colour, large artwork, tiling) but you can wander when it comes to the accessories. 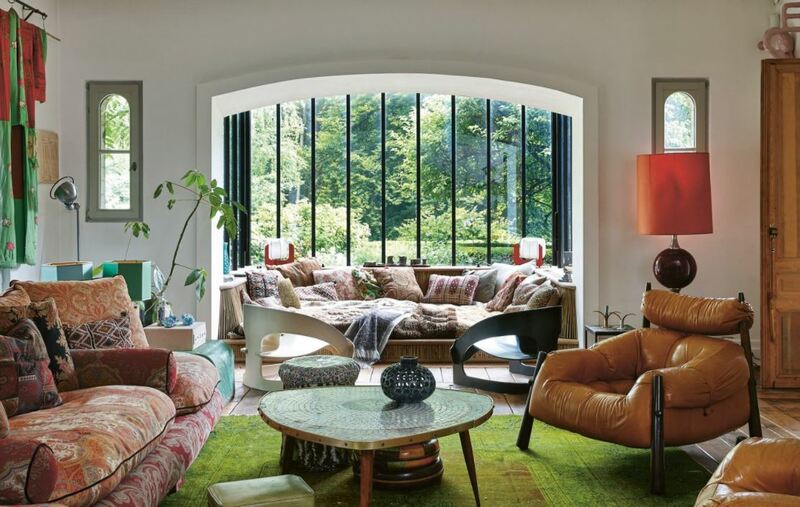 Eclectic schemes lend themselves to self-expression, so put a bit of YOU into it. Hang a painting by you, your family or a friend. Frame memorabilia from a holiday. Keep that antique chair left to you by your grandmother that you love but doesn’t quite ‘go’. If it’s really out there you could reupholster it with a modern fabric to tie it to the scheme. 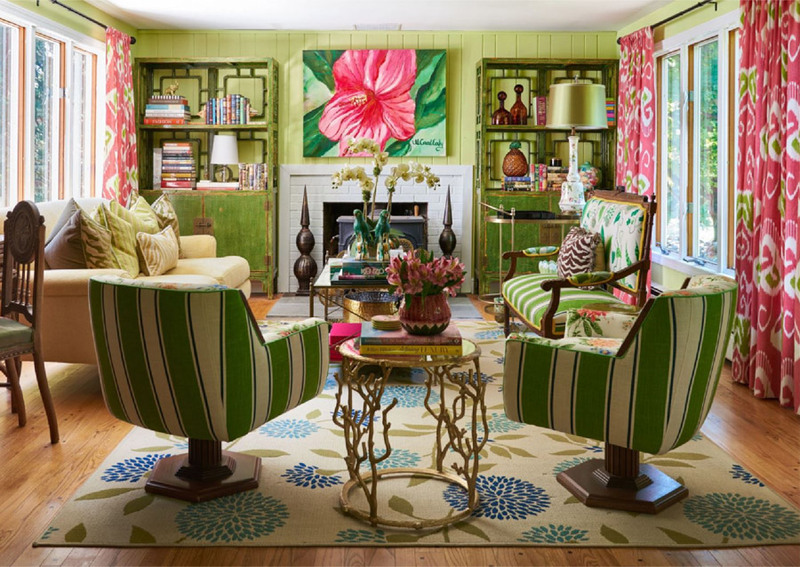 How do you bring multiple patterns into a space and maintain a pleasing balance and harmony? You pick a feature to build off of, and choose subsequent patterns of different scales. Patterns of a similar theme (floral, geometric, stripe) and scale will fight with each other and cause the space to seem loud and confusing. Your feature should spark joy and could be anything from a custom lamp, designer fabric for cushions of a window treatment, a patterned rug, fun wallpaper or statement artwork. 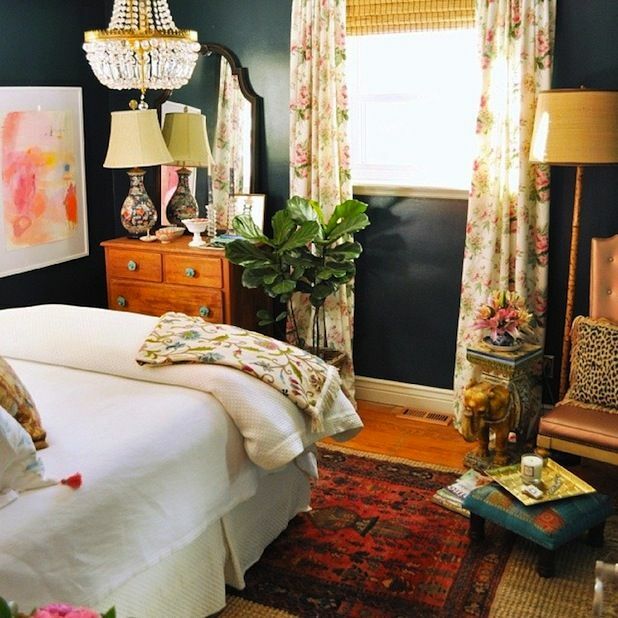 From my experience trying to find the perfect statement rug or painting after the fact is a much harder feat. Now you can pick textiles, artwork and homewares based on the colours from your feature item. Mix large scale florals with medium scale geometrics, plains, textures, stripes, animal prints and anything in between. Go wild and be brave. If it sparks joy and works even just a little bit – go for it! A living space that is overpowered by the colour blue can appear cold and uninviting, too much red can be confronting and no colour at all can lack interest. However this can easily be remedied with a pop of the complimentary colour. Be mindful of the tone of your room. In the photo above the dominant colour of the accessories is orange (warm tone) which is balanced by the green rug, leafy outlook and the little pop of aqua (which is a cool tone and also the complimentary colour to orange) in the left corner. It’s not complete until you address your walls. A space will feel unfinished if the only thing above head height is a bare expanse of white. Even if you start and then life gets away from you, it’s okay! Our tastes are always developing and eclectic schemes are perfect at allowing for future growth. There is no rush because there is no need to ditch your whole plan and start a fresh if your tastes change. Introduce new pieces as you go – keep what works and repurpose the rest. If you love it, you will always find the perfect place for it in your house. And my final tip is to preserve the sense of space and lightness by keeping it tidy. The fine line between eclectic and chaotic is easily crossed if you’re struggling to fit everything into your cupboards. If you’re yet to jump on the Konmari bandwagon I highly recommend her books. Or check our my experience with decluttering here.